1. Filters: When in a category, you can filter by size, brand, usage or other relevant product attributes to narrow down your search quickly. Have a look at daypacks for an example. Note: filters are not yet active for all categories. 2. Shop by brands: You can see all the products from your favourite brands by selecting a brand from the drop-down menu on the left. You can also access our brands page from the link in the header. 3. 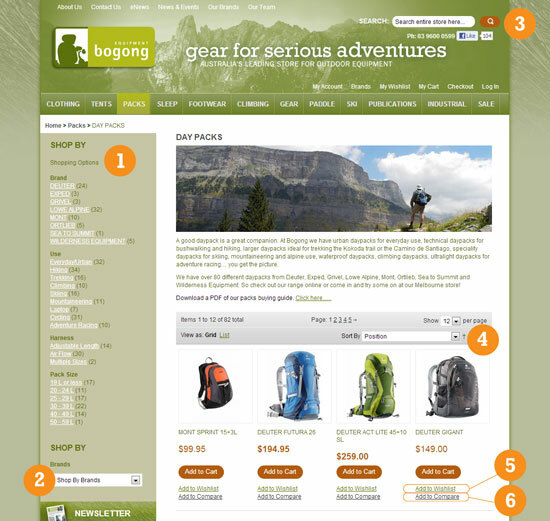 Search for products at any time using the search box. 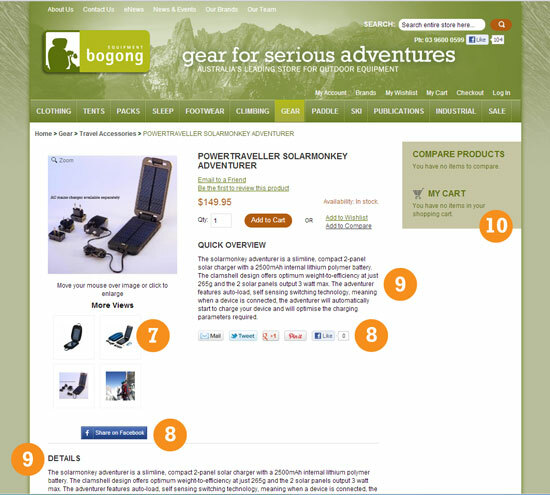 Tip: Use the Advanced Search in the footer if you can't find what you're looking for! 7. See multiple product pictures just by mousing over. Click for a large image. 8. Helping out a friend? Easily share product recommendations on Facebook or other social networks! 10. Easily see the items currently in your cart. 9. Read a product overview here, and more details below.